Inventory We are a resale marketplace, not a box office or venue. Ticket prices may exceed face value. This site is not owned by Van Andel Arena . 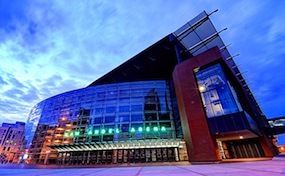 The Van Andel Arena is located in Grand Rapids, Michigan and concert fans love this unique and intimate concert experience. As a concert venue, the Van Andel Arena seats about 12,858 for end-stage shows, and 13,184 for center-stage shows. The arena floor measures 85 by 220 feet. The arena features 9,886 permanent seats and 44 luxury suites, with the 16 luxury suites in the upper bowl seating 20, and the lower 24 bowls seating 15, and the others at 18. There are approximately 1,298 retractable seats at Van Andel Arena. The arena experienced an unprecedented turnout for a free event in 2008 at a Barack Obama campaign stop in 2008. 12,000 people packed into the arena, leaving not one seat left on the floor. The Van Andel Arena remains a popular tour stop for campaigning politicians, and has been visited on numerous occasions by senators, the governor, and presidential candidates. The VanAndel.ArenaGrandRapids.com is a privately held company that specializes in the sale of tickets in the secondary market. We are not affiliated with any official supplier or box office. To purchase tickets to any Van Andel Arena in Grand rapids events simply call our operators at anytime or click on the event you wish to attend.